As I mentioned in my post about my 2011 vegetable garden, I’m trying out companion planting this year. Companion planting means grouping different crops together “on the theory that they assist each other in nutrient uptake, pest control, pollination, and other factors necessary to increasing crop productivity,” according to Wikipedia. 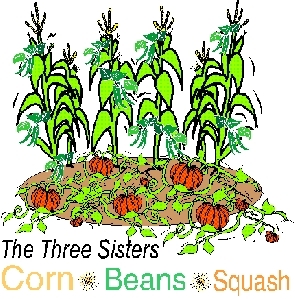 One grouping I’ll be trying this year is called Three Sisters, a combination of corn, beans, and squash that has been used for centuries by the Native Americans. 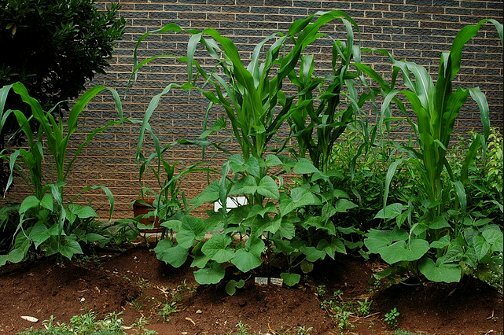 The corn provides a pole for the beans to climb on and the beans provide nitrogen for the corn. The squash spreads on the ground, creating a living mulch that blocks weeds and keeps moisture in. How has companion planting worked for you? A neighbor did this last year, using scarlet runner beans, and it looked so pretty! We don’t have huge yards, so, this works well to maximize the growth for the space he has. I want to try it myself, but will grow pumpkins, just because my family don’t like squashes. Yes, I know, pumpkins are in the squash family, but they don’t. Besides, we need our jack o lanterns for Hallowe’en, and I prefer to grow them. We do a different type of companion planting. We’ve successfully protected our strawberry plants from the deer by surrounding them with rosemary. We haven’t gotten the other plants planted yet, but plan to do the same type of arrangement. Love the idea of scarlet runner beans! That sounds lovely. Kristina, that is such a clever idea to use rosemary to block the deer. I bet they can’t smell them that way. I’ll have to keep that in mind.